When it comes to reliability, 4x4s are at the top of the list, but how can you ensure that yours will always be running smoothly? Preventative maintenance is the key and most importantly, keeping up with regular oil changes goes a long way. Considering the low cost for upkeep, it’s the best way to reduce the risk of engine trouble for the long haul of your vehicle’s life and the most impactful routine service when considering how essential oil is to the daily use of your 4×4. Most importantly, they keep the need for major fixes in check if kept to a regular schedule. If you ever wondered just why changing the oil in your 4×4 is critical, take a look at these reasons below. While they are simply a handful, they detail the major points of this preventative service. Avoiding this maintenance could stop your 4×4 dead in its tracks and that takes all the fun out of owning an offroad vehicle! – Oil Stress – Oil breaks down over time – a fact that your average 4×4 owner may not consider when out on an adventure with your favorite toy. The temperature and stress put on your 4×4 requires the lubricant to be fresh to be effective, but if oil is not changed during the designated time, its quality is degraded until the oil no longer acts as a lubricant at all. In fact, the very opposite occurs, with clogs and gunk bringing your engine to a grinding halt. This form of engine failure is very costly to repair when considering how cost effective regular oil changes are to ward off this possibility. 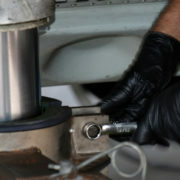 – Oil Filter Clogs – A replacement filter is a part of routine oil changes, installed by one of our expert technicians. A new filter aids in the proper distribution of oil throughout your 4×4’s engine. Not only does it allow clean oil through, but most importantly, this filter keeps build up and sludge out of the engine. Old filters exposed to degraded oil become clogged and useless, bringing damage to internal parts and eventual engine failure. – Cracks & Leaks – Circulated, degraded oil can cause cracks or leaks within the engine thanks to debris which is carried through during use. Additional damage may cause other coolants or even gasoline to leak into the oil. This mixture is toxic to the engine’s performance and could shorten the life of your 4×4. At the very least, it will damage parts of your 4×4’s engine that will be costly to replace. – Corrosion – When old oil is circulated throughout the engine again and again, it spreads corrosion from dirt, dust, and even water accumulation over an extended period of time. These outside elements break down parts of the engine after repeat abuse. The end result in this treatment is also engine failure. During your oil change at All American Four Wheel Drive & Auto Repair, not only will we provide your 4×4 with the top quality oil it requires, but we will also perform a complete diagnostic to provide you with peace of mind. Changing your oil every 3,000 miles or three months is recommended. Allow our expert technicians to service your 4×4 with the care only trained professionals can provide. If you need to get back on the road while we work, take advantage of our free transportation service. Why should a repair or routine maintenance disrupt your day? Making service as easy and carefree as possible is what we’re best at. Contact us today to schedule your next oil change! No one wants to be stuck on the side of the road due to battery failure. A towing service may be costly and it’s wasted time that you cannot get back. Avoid future breakdowns by seeking seasonal maintenance on both your battery and the rest of your 4×4. As temperatures rise here in Littleton, Colorado, your battery takes a hit given the amount of drain forced upon it in the winter months. Now is the time to pay attention to your battery to ensure that it will always keep you safe on the road through all of your journeys. The following tips are essential to prolonging the life of your battery. Given that the average lifespan of a battery is 3 – 5 years, getting the most you can out of it is both essential and cost-effective. Clean all connections – Seasonal battery cleaning helps to remove any build up of corrosion that accumulated over months of use in lower temperatures. Build up of corrosion around the battery’s connectors can disconnect the battery’s power supply, causing a random lack of power or a sudden burst. Check the tightness of all terminals to gives yourself the piece of mind that there are no leaks to damage both the battery and the engine. Disconnect the battery when possible – When a battery remains idle for too long, the charge will suffer dramatically. Worse still, it may damage the responsiveness of the alternator, causing an unreliable start-up. If you plan to be unable to drive for over two weeks, disconnecting the battery is highly recommended to prolong its life. This will keep the electronic demand low – a usual culprit for draining battery life. Upon your return to regular driving, reconnect the battery properly to be back in action. Avoid frequent, short trips – The alternator recharges the battery while your vehicle is being driven, but the battery’s charge suffers greatly when the vehicle is making short, frequent trips. 4x4s are like no other type of vehicle. Opening them up on the road in the name of recharging the battery is a small price to pay. Just twenty minutes of consecutive driving per week is enough to let the alternator do its work and recharge the battery as the car is being driven. To get the most out of your 4×4’s battery, seasonal routine maintenance is required. When you bring your car in to All American 4×4 for that maintenance appointment, do mention any battery concerns and we will do a diagnostic straight away. We are happy to ensure that your 4×4 is operating at optimal standards across the board. Contact All American 4×4 today and schedule your spring maintenance appointment. Don’t wait until a major issue comes to light. Preventative maintenance safes money in the long run and may help you avoid major repairs down the road. Our 4×4 diagnostics test will point out any problems within your vehicle. Our skilled technicians are ready to offer repair options with your budget in mind. Allow the experts at All American 4×4 extend the life of your battery and ensure that your 4×4 is safe and ready to take to the road this spring.